Today I return to my blog to continue with my series on “The Best Moments in Film History”. After my first post touching upon the magnificent performance of Kevin Spacey as John Doe in Se7en, I switch gears to a touching moment in film personified by the timeless Marlon Brando. By the way Apocalypse Now is constructed, the screen required someone with the presence and emotional power of Brando, Hollywood’s ultimate acting virtuoso, to bring the story arch to a satisfying close. The film had traveled, in a metaphorical and literal level, to a point in which it could have collapsed under the weight of its own expectations. Brando did not only bring the excellence of his craft to the fore, but all the mystery of his persona and the aura of greatness that accompanied him from early on in his career. The success of a performance, as actors themselves would tell you, comes also from listening to other actors. In this film, Martin Sheen plays Captain Willard in a performance that is powerful because it is restrained. In the more of two hours of film, the Captain does a lot of listening and observing, acting as a small pawn thrown into the middle of the Lion’s den. When Willard becomes Kurtz’ prisoner, the Captain acts in reaction to the madness that surrounds him, in an attempt to stay alive and gain the trust of Kurtz until he can achieve his mission: killing him. Marlon plays Colonel Kurtz as a man that has lost his mind but who, at the same time, can be rational enough to eloquently reveal part of the torment that haunts him. It can be argued that Apocalypse Now does have other moments that are indelible and helped make the movie what it is. However, if it had not been for the great Marlon and his hopeless words that summarized the goal of the film, there would not be an Apocalypse Now in any list comprising the best films of all time. For Brando it was perhaps the last great role of his incredible carreer, one that changed the concept of acting forever. My challenge to watch the IMDB TOP 250 films of all-time continues. Today is yet another pleasurable encounter with my keyboard as I get to review a very unique and accomplished film: Apocalypse Now. 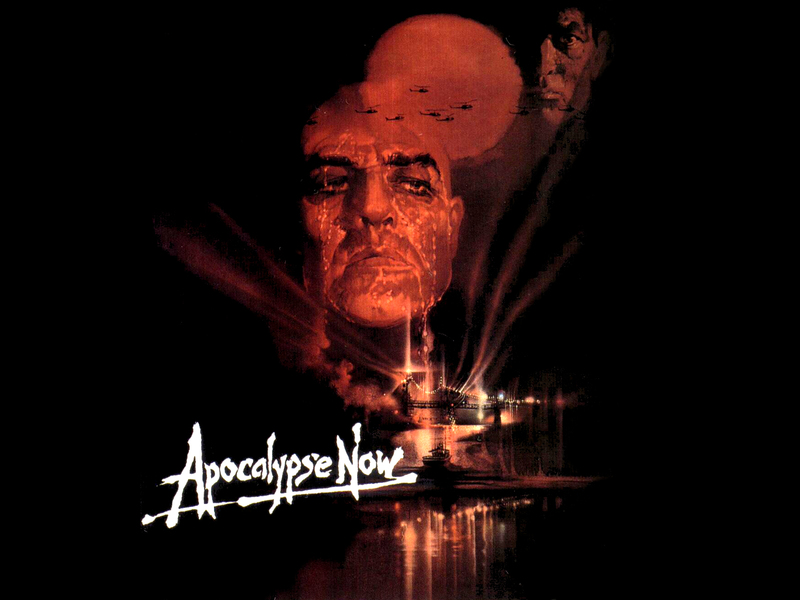 At 153 minutes, Apocalypse Now is a very long movie that fails only in its lack of momentum which, at times, can make the movie drag a bit in its final few scenes. However, the film, directed by Francis Ford Coppola, moves with a gentle pace so we can absorb and get to know the Vietnamese jungle intimately at the time of the American occupation following the rise of Comunism in the Far East. 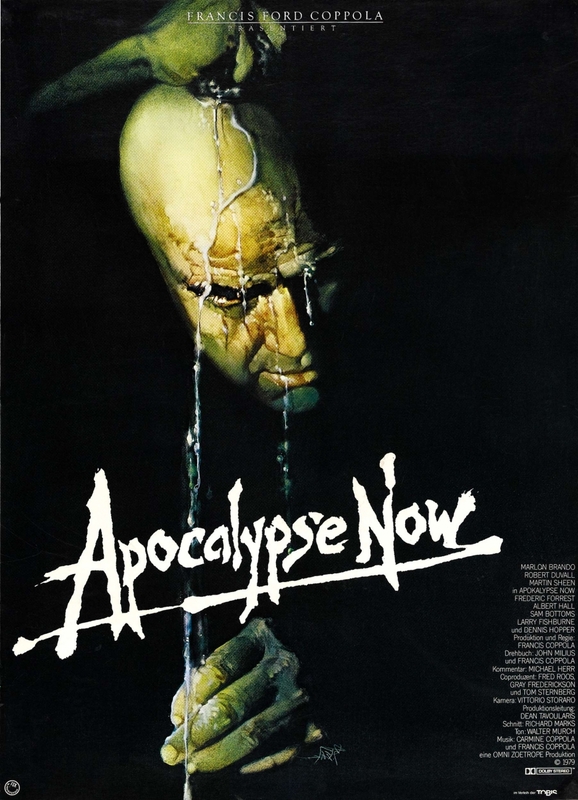 It is a film that, without a doubt, pays homage to its title by attempting, with great success, to capture the apocalyptical devastation caused by the war in the hearts and minds of the people of Vietnam, of American soldiers, and of a country that had grown doubtful of the whole military campaign. For most of its length, the film follows Captain Willard (Martin Sheen) on a strange mission to assassinate a rogue Green Beret beyond the thick jungle and into the depths of remote Cambodia where he is believed to be. We first encounter Willard laying anxiously on his bed, back in the United States, narrating his inability to lead a normal life while his mind and heart had stayed in Vietnam. He waits for a new deployment, abhorring his new uneventful life away from the chaotic setting of the war. When Willard finally gets his wish and is reassigned to the war, he narrates from the future, explaining that the place he was headed to was the worst place in the world. It comes as no surprise that the movie becomes more about the path than about the destination. After meeting with some officials that include a very young Harrison Ford, Willard is assigned a small group of soldiers to navigate across Vietnam and into Cambodia. Along the way we are reminded of the objective of the mission by Willard’s narration, but it slowly fades into the background as we are presented with the horror of the war and the collapse of the American endeavor. First, Willard meets an official, masterfully played by Robert Duvall, who is portrayed as an odd mutation of the rigid West-Point trained officer, always walking with confidence and unafraid of his surroundings, as if he knew he wasnt meant to die in the war. Such confidence borders with insanity as he seems detached from what is happening around him and asks the impossible from his troops, repeatedly risking their lives more for his depraved entertainment, than for a true military purpose. Like the officer, Willard encountered one odd situation after another, showing us an American force that was poorly trained, managed and directed, with soldiers that had lost their grip on reality, leaving morality far behind. In this context, Willard begins to find a strange wisdom in the words and actions of the mad-man he is supposed to kill. Willard doubts the purpose of the mission more and more as it becomes clear to him that a rogue Green Beret is just a small problem in a war effort that is falling apart in front of his eyes. In the more than 2 hours of the film, Willard remains the more sane of all characters, even when he is part of a mission with little purpose and that is depicted as a consequence to the insanity of the circumstances. By the time Willard finally meets the rogue Colonel Kurtz, he is only with a couple of soldiers, trapped in a foreign world where madness was apparent everywhere, yet no one seemed to notice. Sadly, the film anticipates the moment so much and for so long that even if the Colonel, played rather subtly by the great Marlon Brando, had been wearing an elephant head for a hat, we would have felt a bit let down by the “monster” Willard was supposed to encounter. Above all, Apocalypse Now is an effective atmospheric poem about how pointless and tragic the War in Vietnam was. Marlon Brando, in this sense, becomes Coppola’s flagship to represent the ultimate American tragedy: a promising, smart and courageous leader of men driven to despair and insanity by the horror of a needless war.